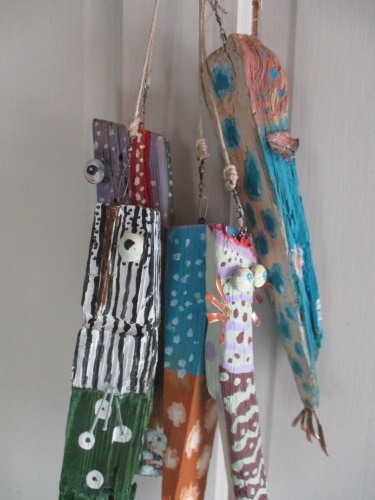 Five colorful FiSh of varying sizes, attached with twine on a metal fishing-swivel. Copper fins and metal flooring nails. They can be arranged however you wish. Shipping and Handling additional charge. Largest piece approx. a foot in length. (Green with white polka dots & white head with black stripes) Lots of fun and sure to bring comments.